The following is a letter-to-the-editor of the Greenwich Graphic dated July 4, 1903. It was written by Solomon Stoddard Mead. He lived on the family farm at the corner of Riversville and Cliffdale roads in North Greenwich. Mead died June 7, 1906, and he is buried in the North Greenwich Congregational Church Cemetery at the corner of Riversville Road and John Street. His death notice in the New York Times was printed as follows: MEAD- At Quaker Ridge, Greenwich, Conn., June 7, 1906, Solomon S. Mead, aged 80 years. Funeral services at his late residence June 9, at 4 P.M. Carriages will be waiting at Greenwich Station for train arriving from the East at 1:40 P.M. and train leaving Grand Central Depot 2 o'clock P.M. I am an advocate of good roads to Travel over for the few remaining days that I will be among you, and I know that good roads are everything to any country or town. There is nothing whatever that will boom a place like good roads. But to have them you must have them worked and graded by a person who is competent to do the job. If you want your gold watch repaired when out of order you must employ a man who understands his business of the job will be worse after a poor workman has had it in charge than when you left it in his care, and so you must have a man to work a road who has some knowledge of what is needed. If for the past one hundred years the roads had been properly worked they would now be in number one condition and there would be no cause to complain. But they are worked just as they have been for years; if there is a wall in the gutter, instead of blasting it a huge break is placed across the road to carry the water from one side to the other. And the roads are made up so narrow that one horse has to travel on the ridge and the other in the gutter, and no matter how much space there is between the fences the roads are worked to a single track and only occasionally a place where one can pass a loaded team in front of him or where one can pass a loaded team coming toward you. The roads are all too narrow and I can show roads that have been narrowed up in the past two years from three to four feet. To me this is all wrong and no road should be worked less than twenty-five feet across and in no instance a break should be permitted on any road. If it is necessary for the water to pass from one side of the road to the other let it be done with a pipe; iron is best, earthen would do. I know it is very hard for persons who have schooled themselves to work a road in the old way to change, but the change must come and will come if the present road makers will insist on the old way, give the roads to someone who will. My idea of working roads would be to first draw a line on each side as far as it could be done conveniently and make the place straight if the distance was long or short, and where a rock interferes with the gutter blast it out. Have the road as wide as twenty or twenty-five feet and not round it up too much, but enough so all the surface water would run off its sides, not follow the wheel track. And above all never go into a road-bank or a lot of dirt or gravel when there are hundreds of hillocks all along the roadway that should first be removed, by ploughing and carting where it may be needed. I see hundreds of these knolls all along the roads I travel about Greenwich. I feel very proud of the town that gave me birth and I hope to see it still improved and everyone that belongs in Greenwich should take an interest in its welfare. I never felt one half so proud of my native town as I do today, because I have seen more of good, and bad, that has been presented to my view. Now let every body go for good wide and well-graded roads and if one will not do it get someone that will. Let the old foggies go. I am truly disappointed in the working of the highways this season. That the roads are very rough and uneven and so narrow up from four to six feet that it is very dangerous for driving when one meets say half a dozen automobiles one after another, and the autos are bound to keep the road and on a one track road it is very dangerous driving, and the roads are so uneven and they seem to me worse then I have known them for years by and gone. I will say here that the auto drivers are generally a class of hogs. An exception is Richard Carpenter, of the Upper King Street Road. He always gives all he can to the driving horse class and stops his auto if he sees any horse afraid. I must say that I do not think I have miscalled or mis-classed the auto drivers. I find they in general do not pay any attention to raising the hand when coming, but on the contrary will keep as near the middle of the road as possible and often they will turn their machine right in front of the horse. I hope someone will put the law in force and bring the autos to know their place, and if they frighten a horse and upset the carriage they will run on the faster to avoid being known I wish every driver of a horse would see the law is complied with. The following text was published in Greenwich Time's 'Looking Back' local history column authored by Jeffrey Bingham Mead. It was published on September 19, 1993. For an audio-visual presentation go to this link on the Association's YouTube channel. Featured photos include Hester Bush Mead's gravestone in Union Cemetery, the watercolor work attributed to her, and a photo of the Jabez Mead House that once stood on the southwestern corner of East Putnam Avenue and Indian Field Road. The Historical Society of the Town of Greenwich acquired this work in February 2006. In a quiet corner of Union Cemetery off Milbank Avenue sits a small, worn marble gravestone. It marks the final resting place of Hester Bush Mead, daughter of Candice Bush. Hester's name does not appear in the roster of famous persons in Greenwich history; her life is obscured by the passage of time. Hester Mead in reality is not a descendant of the original ancestors at all-she is the direct descendant of slaves who were emancipated when Connecticut, with her sister New England states, mandated the abolition of slavery in the late 18th century. Candice Bush, her mother, was a servant in the David Bush household. 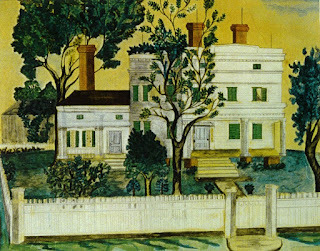 Mr. Bush owned what we preserve today as the Bush-Holley House, headquarters of The Historical Society of the Town of Greenwich. Candice's name appears in the David Bush estate in 1797, and Hester was born there the next year. We believe Hester married a freed back man who was emancipated from service to the Mead's in Greenwich. My interest in Hester centers on a mysterious but beautiful watercolor of one of our ancestral houses. I'm told by a relative that this fine example of early American folk art on woven paper was created by a black woman employed by our forebears; it dates from 1840-1860. The Jabez Mead House, circa 1840, stood at east Putnam Avenue and Indian Field Road. The farm encompassed all of Milbrook and the lands up to the base of Put's Hill. The house was demolished when East Putnam Avenue was widened many years ago. Could Hester be the mystery artist? It's possible, but we may never know since the work is unsigned and no written documentation to confirm this has been uncovered. Hester died March 2, 1864. Her will in the Greenwich Probate Court leaves her few belongings to her granddaughters, Martha and Julia, and ordered good tombstones to be put up for herself and her mother. The austere appearance of her marker may be deceiving if it is true that Hester was the mystery artist of the old homestead built long ago. Jeffrey B. Mead is a free-lance writer and direct descendant of one of the town's founding families. He grew up in backcountry Greenwich and is a member of the Historical Society of the Town of Greenwich.